I'm dead chuffed with myself tonight. Chris and I have been looking at tiller pins for AmyJo but have not been able to find anything that takes our fancy. With our sailing background we really wanted something that relates to sailing boats. We looked around and simply could not find any sail boat tiller pins. I did bit more Googling and realised that most tiller pins consisted of a brass ornament with a stainless rod, usually 6mm to 8mm diameter, screwed into its base. 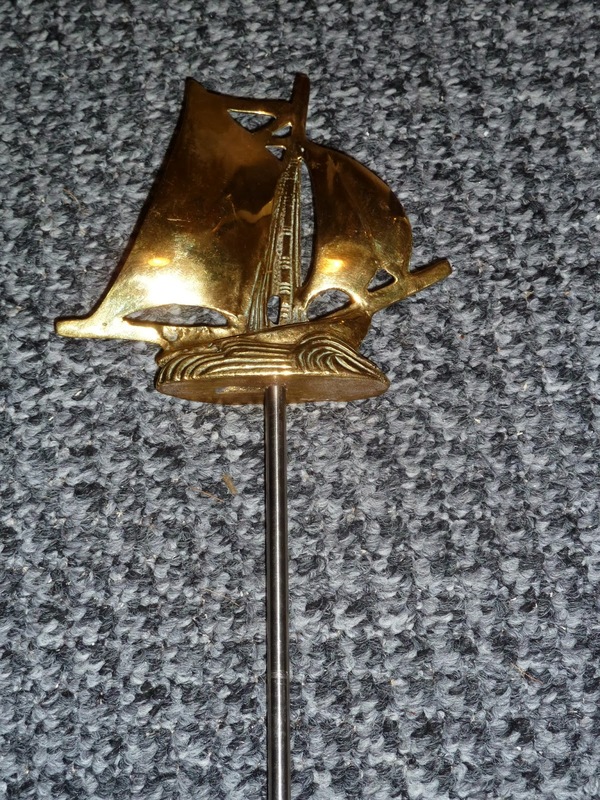 So I searched around for a brass sailing boat ornament or paper weight but most of them consisted of tall, sharp and pointed sails, far too dangerous for my liking. I was about to give up on the idea when I came across a brass sailing boat about 4 inches tall with sails that would not act as a dagger and thought it would make a suitable tiller pin, but, how to make it into one? My metalwork skills have never been that good but when Roy passed away I inherited several taps and dies suitable for creating threads. I looked through these and found a tap and die for an M6 metric thread and resolved to have a go at it myself. Be interested to know how you get on with the chroming. We were trying to get our mushroom vents re-chromed the cost worked out more than buying new ones! The tiller pin looks great and so unique! I found a place in Crewe called Niphos (http://www.niphos.co.uk/)and the guy there was really good. He's quoted a really good price, far less than I thought it would be. Hello, the tiller pin that Fernwood provided for Oakfield plopped off into the canal while we were cruising! After making an excellent prototype tillerpin for AmyJo perhaps you could make more to trade when you are cruising!